MADISON – On Saturday, March 16 from 10 a.m. to 1 p.m. at Madison High School, people can drop off their tech items to be recycled. This will be a joint effort between PCgone Recycling and members of the Madison High School Tech Club. Burt Sivon, computer technology teacher at Madison High School, and tech club members are the driving forces behind this “tech recycle day.” Participating tech students are: seniors – Anna Froebe and Shane Noblit; juniors – Charles Barnicoat and Jonathan Hammel; sophomores – Kamron Saba, Soo Yun Varga, Rowan Brown, Phoenix Martin, Ava Cox, and Megan Porter; and freshmen – Nicholai Marko and Wesley Kimble. The items that are dropped off will be refurbished, if possible, he said. The usable parts from different products will be reused or properly recycled. “The ultimate purpose of the recycling event is to provide a service to residents in and around our community,” Sivon said. “We have partnered with a local company, PCgone, 36580 Biltmore Place, Unit 4, Willoughby. The goal is to keep toxic waste out of landfills while securely erasing data. PCgone will reuse and resell parts collected while properly disposing of any materials they cannot use. He also wanted to remind people that spring is just around the corner and this would be a great time to start spring cleaning and getting rid of any old or unused tech items. • Recycling e-waste conserves natural resources that can be refurbished and reused. • E-waste is the most rapidly growing part of solid waste landfills and recycling helps limit this. • Several e-waste materials contain toxic and hazardous material such as mercury and lead which have the potential to leach into our soil and water. For more information about what can be dropped off or more information on e-waste, visit the PCgone website at http://pcgone.com/commercial recycling.html. 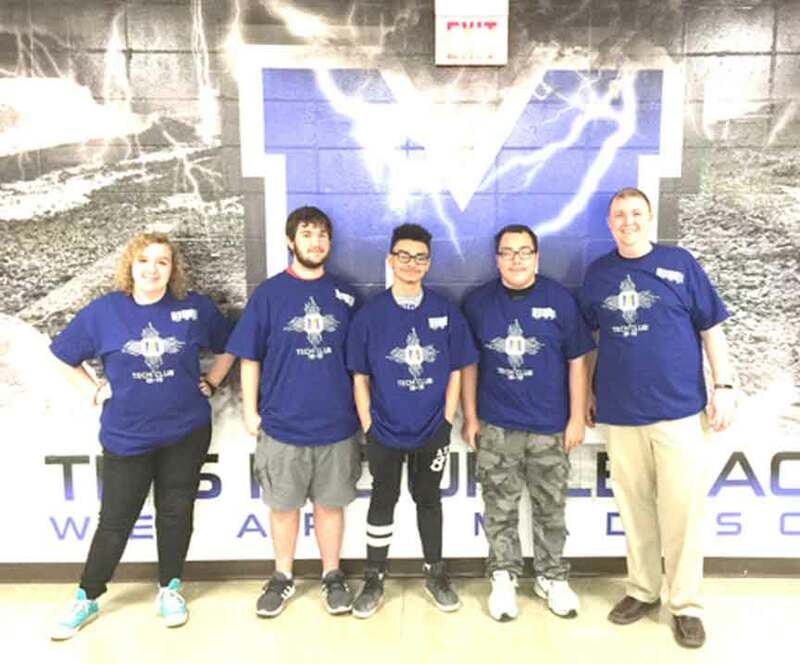 A few of the Madison High School tech club members model their new club t-shirts, left to right, Anna Froebe, Charles Barnicoat, Wesley Kimble, Kamron Saba, and Burt Sivon (computer technology teacher at Madison High School). “From the collection last year the school received $153. We used a portion of the money to pay for club t-shirts for the students. It is a goal of the club to establish a technology scholarship for a graduating senior at Madison High School in the future. The students really enjoy this event. They enjoy looking at the old equipment, talking with the people who drop it off, and organizing the materials onto the truck. Afterwards we go to lunch as a club and it makes for an enjoyable experience,” said Sivon.